"These findings highlight a novel role of the innate immune response in chronic lung diseases and could be used for the development of new diagnostics and therapeutics for COPD and possibly cystic fibrosis," said James Kiley, PhD, Director of the Division of Lung Diseases at the National Heart, Lung, and Blood Institute, part of the National Institutes of Health. COPD, a smoking-associated disease, is marked by PMN-driven inflammation in the lungs. Damage to the lung tissue leads to airway obstruction, shortness of breath, and respiratory failure. PMN immune cells, also known as neutrophils, are part of the body's white blood cell defense against infections and tissue damage. 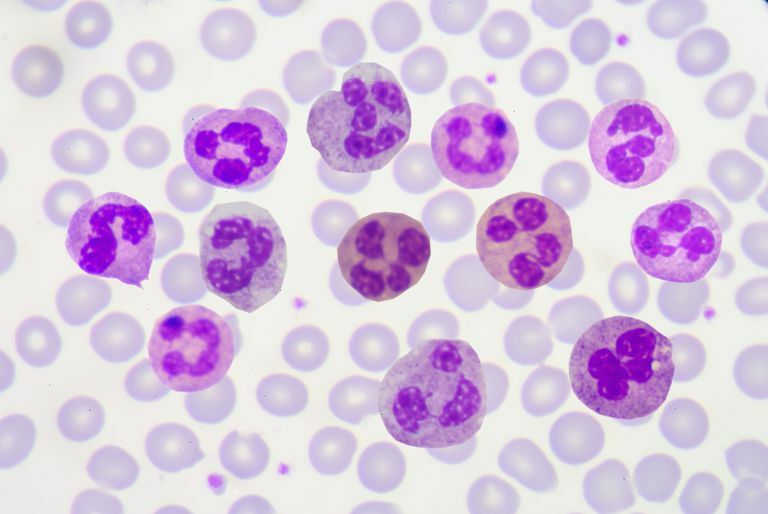 They comprise 60 percent of the body's white blood cells, or about 2.5 billion PMNs in each pint of blood. PMNs are voracious eaters of microbes or damaged human cells after activation by a signal of infection. All cells shed exosomes. These tiny extracellular membrane-bound vesicles can be mediators of cell-to-cell communication, and they can ferry a diverse cargo of proteins, lipids, and nucleic acids from cell to cell. The UAB research focused on a recently found third role for exosomes -- the ability to harbor protease enzymes. Activated PMNs are known to release neutrophil elastase (NE), a protease that can degrade type I collagen and elastin. The collagen and elastin proteins help form the extracellular matrix that glues cells together. In the lungs, the extracellular matrix and lung cells are sheets of tissue that help form the tiny alveoli, where the lung exchanges oxygen and carbon dioxide. In COPD, the damaged alveoli enlarge, reducing oxygen exchange and forcing the heart to pump harder to push blood through the lungs. Dr. Blalock and fellow researchers investigated whether NE might exist in an exosomal form and whether such exosomes might bypass alpha1-antitrypsin inhibition to contribute to inflammatory lung disease. They found that exosomes from quiescent PMNs did not cause COPD when transferred to healthy mice. In contrast, exosomes from activated PMNs did cause COPD, as measured by histologic changes of the alveoli, increased pulmonary resistance, and enlargement of the right heart ventricle that pumps blood to the lung. A very large dose of purified NE -- enough to overwhelm the alpha1-antitrypsin barrier -- can cause alveolar enlargement in mice. Because the exosome-bound NE was protected against apha1-antitrypsin inhibition, researchers found that the dose of activated PMN exosomes needed to cause the same damage as purified NE was 10,000 times less. The activated PMN exosomes had another cause for their aggressive proteolysis -- they carried integrin Mac-1 on their surface. Integrin Mac-1 allowed the exosomes to bind directly to collagen fibrils, a second mechanism besides protected NE for why the proteolytic exosomes exert an outsized degradative capacity in relation to their size and protease load. "This investigation reveals an entirely unappreciated aspect of the interplay between inflammation, proteolysis, and matrix remodeling with far-reaching implications for future research," Dr. Blalock said. "Our report significantly expands the biological repertoire of the exosome, demonstrating potent biological effects of these particles ex cellula." The study also suggests therapeutic strategies to interrupt pathogenic aspects of PMN exosome function: (1) disrupting the ionic binding of the NE to the exosome, to dislodge the NE and make it susceptible to alpha1-antitrypsin; (2) inhibiting the exosomal integrin Mac-1 to block collagen binding; and (3) directly inhibiting the exosomal NE with small-molecule compounds. Blalock is also interested in another big question -- exosome activity in healthy smokers. "Only one in seven or one in eight smokers gets COPD," he said. "It would be an amazing outcome if we found activated PMN exosomes in a subpopulation of people who smoke." Those people could then be warned of the risk they faced. Significant research fir this study was done by co-first authors Kristopher Genschmer, PhD, and Derek W. Russell, MD, who were NIH T32 grant trainees with Dr. Blalock. Both are Assistant Professors in the UAB Division of Pulmonary, Allergy, and Critical Care Medicine. Amit Gaggar, MD, PhD, a Professor of Pulmonary, Allergy, and Critical Care Medicine, is co-senior author with Dr. Blalock, and he is a former trainee who did his PhD with Dr. Blalock. Co-author Charitharth Vivek Lal, MD, Assistant Professor in the UAB Pediatrics Division of Neonatology, is the physician who collected the lung fluid from neonates and performed all of the bronchopulmonary dysplasia work. Co-authors with Genschmer, Russell, Gaggar, Lal and Blalock of the Cell paper are Tomasz Szul, Mojtaba Abdul Roda, Xin Xu, Liliana Viera, Tarek H. Abdalla, Robert W. King, J. Michael Wells and Mark T. Dransfield, UAB Department of Medicine, Division of Pulmonary, Allergy, and Critical Care Medicine; Preston E. Bratcher, National Jewish Medical Center, Denver, Colorado; Brett D. Noerager, University of Montevallo, Montevallo, Alabama; Gabriel Rezonzew, UAB Department of Pediatrics; Brian S. Dobosh, Camilla Margaroli, and Rabindra Tirouvanziam, Department of Pediatrics, Emory University, Atlanta, Georgia; and Carmel M. McNicholas, UAB Department of Cell, Developmental, and Integrative Biology. Dr. Blalock is a Distinguished Professor in the UAB School of Medicine, and he holds the Nancy E. Dunlap, M.D., Endowed Chair in Pulmonary Disease.